There’s an important paper in early view in PNAS describing profound changes in the dominant currents of the North Atlantic since the 1970s. What’s intriguing here—apart from the findings—is the method of determining these changes. 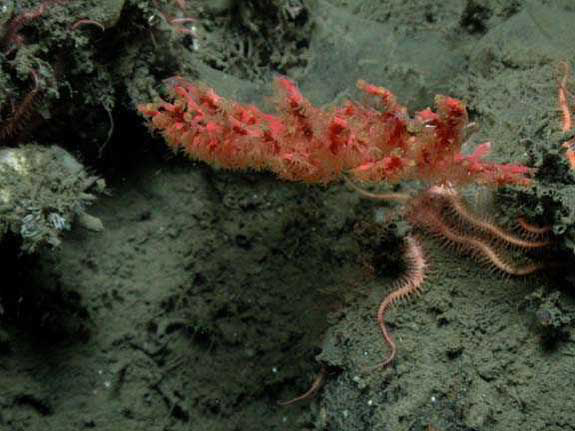 The authors used new technology to parse the story of ocean circulation from the story of ocean productivity using the skeletons of deepwater gorgonian corals. Specifically, they employed a process of amino acid analysis of nitrogen stable isotopes (δ15N-AA), as recorded in the growth rings of corals living between Newfoundland and Maine. The technique promises to be a kind of Rosetta Stone for deciphering the ecological and physical history of the oceans. A deep-water gorgonian coral. Image courtesy of Sanctuary Quest 2002, NOAA/OER. The results reveal a sharply declining influence of the Labrador Current (colder, less saline, and nutrient-poor) in favor of Gulf Stream waters (warmer, saltier, nutrient-rich) since the 1970s, compared to the previous 1,800 years. 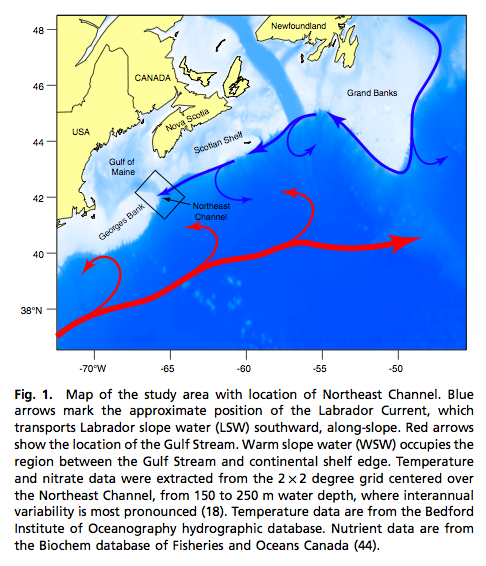 The interplay between the Labrador Current and the Gulf Stream is a crucial component of the North Atlantic Oscillation, one of the major climate drivers for North America and Europe. We therefore conclude that changes in nitrate source partitioning may be tied to recent, human-caused changes in global climate. These results highlight the importance of novel and creative proxies like δ15 N-AA for investigating the links between climate change and ecosystem functioning beyond the last few decades of scientific observations. Owen A. Sherwood, Moritz F. Lehmann, Carsten J. Schubert, David B. Scott, and Matthew D. McCarthy. Nutrient regime shift in the western North Atlantic indicated by compound-specific δ15N of deep-sea gorgonian coral. PNAS. January 3, 2011. DOI: 10.1073/pnas.1004904108.